Has this ever been discussed before? I can't seem to notice a particular thread. Just before I left for the office this morning, the hosts of the Today show were talking about some of the most memorable Christmas presents they had received, and it immediately popped into my head that this would make an interesting topic for a thread. The Today folks were talking about gifts they had received when they were children, but I don't see why this topic couldn't apply to gifts received at any age, or to gifts given as well as received. Three Christmas presents that I received from Santa were so memorable that I still have them! I'm no longer sure of the order in which I received them, but one was my Marx "Fort Apache" play set, a plastic stockade fort with pioneers, Indians, wagons, teepees--the works! A second was a set of Lincoln Logs. A third was a set of model trains with an old-time steam locomotive and passenger cars decorated to represent the train from the TV show Petticoat Junction. Memorable for good or bad reasons? I remember one year getting a Chia Pet. I have two gifts that were given to me by the same couple, Mike and Corrine. I had once discussed I always liked the Volkswagon Beetle, but never had one, it wasn't a useful car for me. 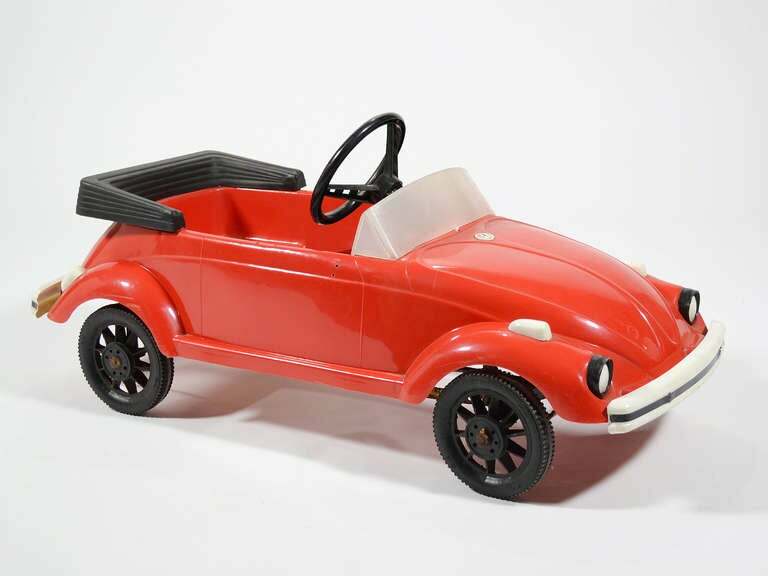 So one year they got me a large die-cast black Volkswagon beetle mounted to a stand, that had a plaque on it "Merry Christmas - Love Mike & Cor"
Another gift they gave, which I still have (like the beetle) was a small, framed inspirational poster, the first Christmas I had as an out gay man. If I recall correctly, it's a scene of a waterfall and says something like "Sometimes what we see as endings, are actually new beginnnings." 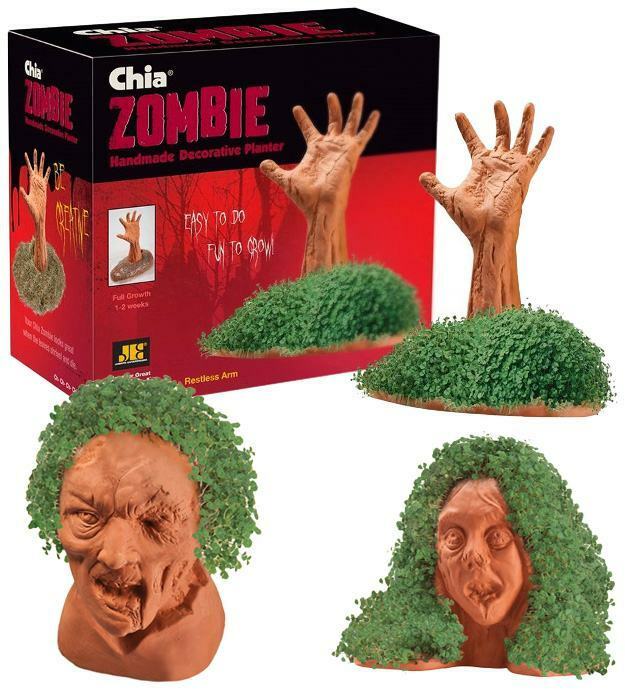 Years ago we banned Chia Pets from my club's gift exchange because someone always got one. Which reminds me. ... At the risk of going off my own topic, this year I haven't seen commercials for either Chia Pets or the Clapper. Now that you mention it, I haven't seen them yet either. clap on, clap off, clap on, clap off, The Clapper! Maybe we should just wait another week, and they'll advertise them for people who need last-minute emergency gifts. 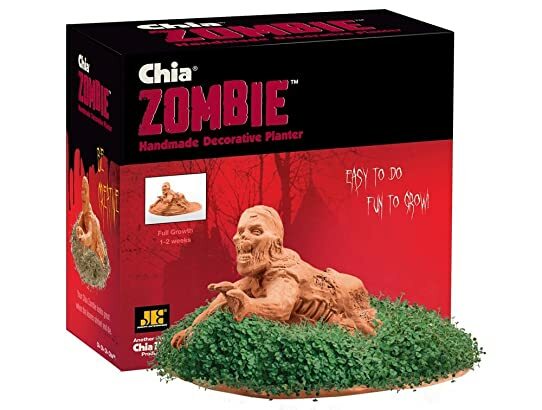 I mentioned this to someone here at work, and he pointed out that people are eating chia seeds now, so maybe there aren't any around for Chia Pets. I gave a little Ford pickup truck in the famous colors to EDelMar a year or two ago. It has a little Christmas tree in the back. I think Chrissi has one. Memorable presents I have received, last year my son gave me a Camelback. It is a small backpack that has a water reservoir in the back and a tube so that you can stay hydrated without stopping. Also he gave me a rock climbing helmet which I cherish. My daughter gave me a cap and scarf that she had knitted herself. I get compliments every time I wear them. Doesn't anyone else have anything memorable from childhood holidays? - I remember getting a navy blue Tonka military Jeep when I was very young. - One year I got a battery operated robot that sort of scooted along on wheels under its feet, and every so often its chest would open and these little plastic guns would pop out shoot light flashes. - One year my brothers and I got a joint present of a Hot Wheels racing system with cars, tracks, ramps, etc. The most fun part of that was whacking each other with the flexible orange track segments. I remember getting Smash Up Derby set one Christmas. I had a few sets of those. Great idea for a thread, Jeff! I have two memorable gifts I got as a kid. One were a pair of bright red winter boots. Technically I got them for my birthday, but since it's so close to Christmas I think it counts. I loved those boots to no end, they were completely red from the outside, the sole, mid-part, bootleg and even the zipper, and they had a lining of artificial lamb-fur on the inside. I think I never had cold feet in them, but that might be my imagination. The second was a Sony Walkman I got from my father back in the eighties when they were THE thing to have. I cherished it for many years. Brad, I would have LOVED your pedal-driven firetruck! Milo, boy do I remember HotWheels! Those orange tracks made great weapons. Remember the funny purple plastic connectors? I think my brother and I had some elaborate figure eights with ramps. 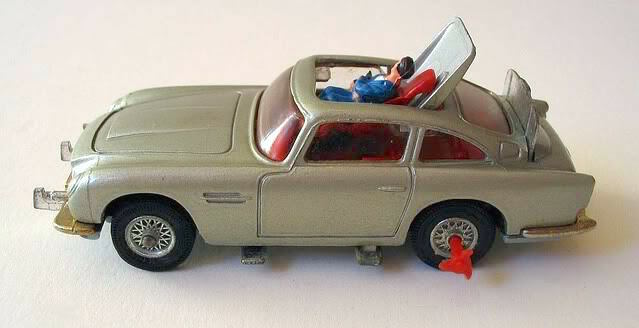 --A toy Aston Martin from the Bond film "Goldfinger". It was little, but it did stuff: a button would pop out guns in front; another button would pop up a rear shield; a third button would eject the villain out of the roof! Way cool. I have to admit that I bought one at a flea market a few years ago. Yes, it seems, you can buy back your childhood. --Another favorite was also a car: the 60s TV version of the Batmobile. It had a rocket thingie, a fire exhaust, and a cutting wheel out the front. Plus, very cool "fins" and bluish turquoise bubble glass. My brother and I played with this endlessly. No, I haven't bought one lately. --As the kids got older, my parents would get us a "kids" group present. Most memorable was a pinball machine. It was small and tinny, but it worked great, with bells and lights and bumpers. Plus, no quarters necessary! --The last memorable present I recall was also a "kids" group present: our own phone line. My dad was always on call, and as we kids got older, we were constantly on the phone and getting interrupted, so we got our own phone with an extra-long cord for privacy. I still remember the number. Our cousin Darrell had one of these. I'm glad I had the idea for this thread. Brad's fire truck reminds me that at some time in my childhood I had a military jeep. Heaven only knows when that disappeared. It probably wasn't the best thing for a little boy growing up in a row house in the city--no place really to ride it. And Paul reminds me that I had a pinball machine, too. Funny that I don't remember my mother getting rid of any of these things. I think my Tonka fire truck (thanks for reminding me of that, Milo) is still in my dad's basement. It came with its own little fire hydrant, and you could hook a garden hose up to the fire hydrant and shoot water out of the truck's fire hose. I agree with Paul: You can buy back your childhood--at least to some extent. That "Fort Apache" play set I mentioned had lost a lot of pieces over the years, and I've spent a lot "reconstructing" it. I also bought another Marx playset I had as a kid: "The Flintstones"! It was a complete little town of Bedrock, and there's a real story to this one. It must have been "big" the year I got it, and my mother couldn't find one anywhere. Finally, she convinced a store manager somewhere to sell her the display model, the only one they had left! That Batmobile is cool! Love the tail fins! Of course, I remember when ordinary cars had tail fins, but never mind! You're not alone on that one. One year my brothers and I got a joint present of a Hot Wheels racing system with cars, tracks, ramps, etc. The most fun part of that was whacking each other with the flexible orange track segments. My younger brother loved those, he had about 3 different sets. I didn't have that, but I remember seeing it, a friend must've had it way back when. I didn't have a firetruck, but I remember having one of these. My dad worked for the railroad, and my youngest brother (Chris) developed a love for trains because of that. 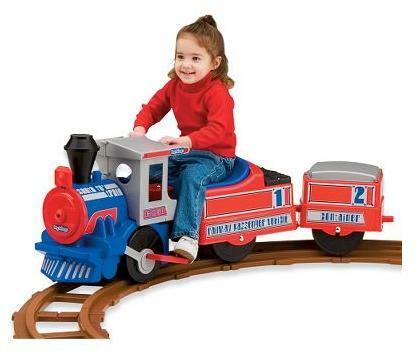 When he was little, I remember him getting one of these as a toddler. It wasn't this exact one, but something similar. Makes you wish you still had yours, doesn't it? Here's a little present my daughter gave me when she was about 8 years old. It's a card that forms a triptych of the word "joy". In the O is a picture of her. It's one of my most treasured things. Christmas is getting close. I saw Chia Pets in the drug store this afternoon! Also Chia Spider-Man and a Chia Zombie! apparently, you can get three different versions of the zombie. There must be more. The one at the drug store wasn't just a head or other body part. It was a whole zombie. The biggest surprise I got this Christmas was a "Justice League" canvas to hang with my Super Friends memorabilia, from my niece, Shana. One thing I found interesting was that they mixed the line-up between the original line up, and the popular cartoon that aired some time ago. From the comic they used Flash, Martian Manhunter, Wonder Woman, Superman, and Batman. Green Lantern was always a Justice League member, but the first incarnation was Hal Jordan, a white man. When he relinquished his title, John Stewart, a black man, became the new Green Lantern. That GL was featured in the cartoon, and is on my canvas. Lastly, Hawkman was an original League member, and later was joined by his wife, Hawkwoman. When the cartoon aired, the creators decided they wanted female character besides Wonder Woman, so they replaced Hawkman with Hawkwoman, and she is the character used on my canvas. Hey Jeff, I just saw this online. Is this what you saw?